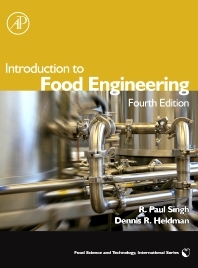 This fourth edition of this successful textbook succinctly presents the engineering concepts and unit operations used in food processing, in a unique blend of principles with applications. Depth of coverage is very high. The authors use their many years of teaching to present food engineering concepts in a logical progression that covers the standard course curriculum. Both are specialists in engineering and world-renowned. Chapters describe the application of a particular principle followed by the quantitative relationships that define the related processes, solved examples and problems to test understanding. Undergraduate and graduate students of food science/food process engineering; professionals in food and process engineering (particularly food manufacturing and ingredients); individuals involved in food safety, food manufacturing standards, and regulatory bodies.